The other day, I moseyed on out to the mailbox, opened the small black door, and was greeted to a very odd site. My picture was in my mailbox. At first, I looked around. Was this a joke? What in the world? Then I pulled out the lone slip of cardboard and saw what it was. I might have done this little jig dance in the driveway before I feared that the neighbor across the street who likes to sit on his porch would see me and thinking something was wrong, like a spider had gone down my shirt or something. So I calmed myself, walked to my van where I’d already buckled Annabelle in, closed the door, and squealed very loud. Poor Annabelle. It got even BETTER a few days later when I drove by Lifeway (it may or may not have been on purpose…) and saw a sign like THIS on either side of the door. The cool, fun thing is that it was right below the poster for Karen Kingsbury, who will be signing for her new release just a few days after me. Yeah, talk about pressure to perform! I feel like I’m her “pre”show at the bookstore! HA! Let’s just put it that way. I’m ALSO getting the privilege to speak at the Southern Festival of Books this Friday at 4pm in downtown Nashville. HOW COOL IS THAT. I’m nervous about this too… but am kind of not letting myself think too much about it yet. No need to be too nervous too soon, right?? 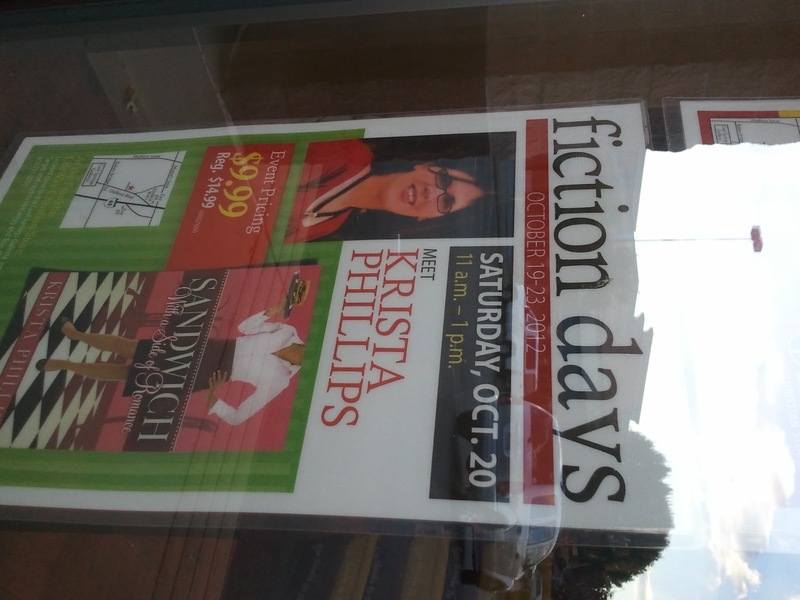 And I’ll be signing books after that, so if you’re in the area and aren’t busy that afternoon, I’d love to see you! I’ll be speaking with the wonderful Julie Cantrell about strong heroine’s in faith-based books. On a very sad note, we were to be a 3 person panel, but sadly, fabulous Julie Cannon, author of Twang, went to be with Jesus suddenly this week. I was so looking forward to meeting her, I’ve heard fabulous things about what a wonderful woman and author she was, so yeah. Please keep her family in your prayers. She’s survived by her husband, daughter and 2 sons, one of them only 14 years old. A reminder to me about how short and precious each day of our lives are, and to make sure we live each day with no regrets and to its fullest. DISCUSSION: Are you a “last minute” get nervous person, or do you fret and stew about things for days/weeks/months in advance? Or are you one of those crazy people who are fearless and have nerves of steel?? I forgot! I’m SUPER excited to be interviewed today on the USAToday Happily Ever After blog!!! 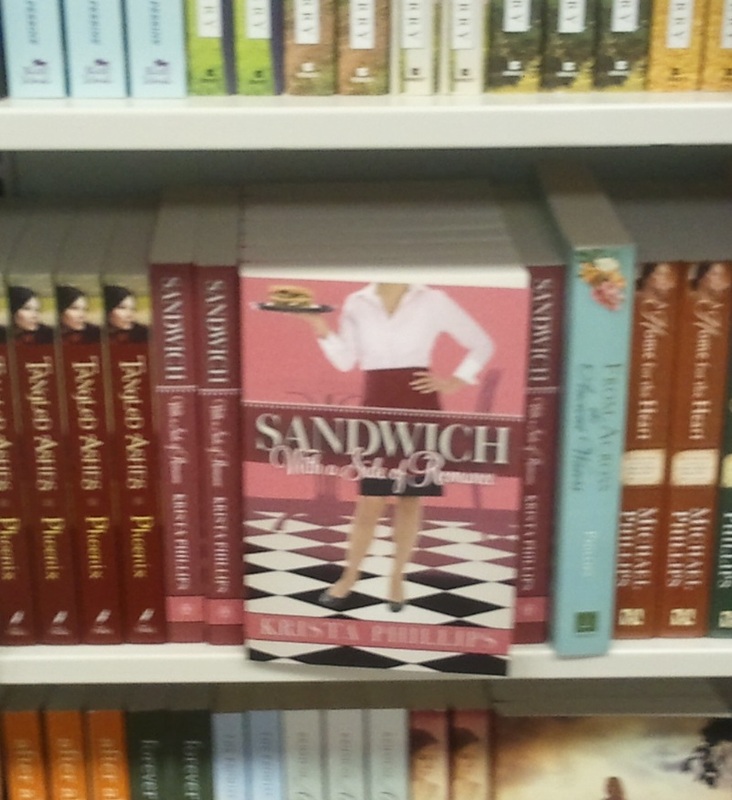 It is USAToday’s blog that focuses on romance novels. HOW COOL IS THAT! A huge thanks to Serena Chase for the opportunity! Yay! Oh, look at the fabulous pictures! How exciting, and congrats! I'm totally a worry, worry, worry kind of girl. I worry as early as possible and as long as possible. Not intentionally, but I still worry. That's awesome! I'm clicking over to read the interview now. 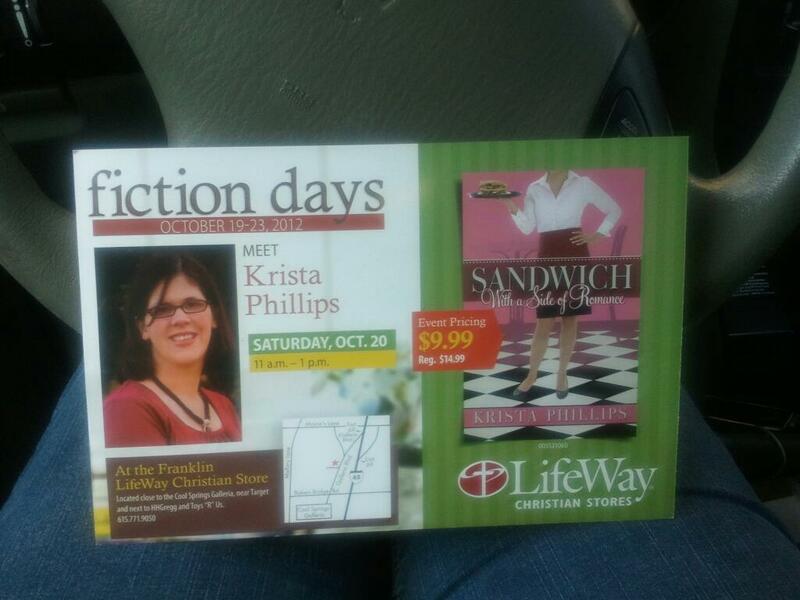 Congratulations on your book, Krista! I know the Lord will give you the strength and grace you need as you speak and sign 100's of books (wish I could be there!). Hugs & Blessings! You are amazing Krista! I'll be praying for you. And yes I worry a lot but I am working on it, giving it to God. How Cool! Loved the interview on the USA Today Happily Ever After blog. It was informative and FUN! I'm sure you'll do well at the book signing. As far as worrying … it depends on the circumstances as to when I start worrying. I'm definitely not one of the those "crazy people who are fearless and have nerves of steel". Just let me say that I've committed Philippians 4:4-9 to memory (OK, I'm still a little rusty on vs. 8 & 9 but know the gist of what they say). If I can remember to quote these, I do a little better. So excited about all the wonderful ways word is getting out about your book. I wish you well at your upcoming events. I just finished your book. Checked it out of my local library. It was funny, smart, tender and I for one couldn't put it down! I read a lot of books and this one has me hoping your next offering will come out soon. Thank you so much for introducing Maddie and Reuben to the Christian romance reading public!! Krista, I have been enjoying your blog so much since I was introduced to your book on dearreader.com. Unfortunately, my local library does not have it yet in its collection, but with a birthday in Nov and then Christmas coming, I ought to be able to guilt . . . I mean "suggest" to one of my family members to buy it for me!! As to worrying, I have often read that the Bible says "fear not" in some form or other 365 times. That's one for every day of the year!! A coincidence?–I think not!! A God-incidence! And those are commands, not suggestions! So–fear not (and that's what worry is, fear about what COULD happen!). Just finished your book on my Kindle..I read it in 3 days. Could not put it down..Awesome book…Thank You and God Bless! !